WASHINGTON (CN) - The U.S. Fish and Wildlife Service plans to provide ecosystem-based protection for 15 species on Hawaii's Big Island, with nearly 19,000 acres of designated critical habitat for one plant to be shared with other previously listed species, according to a proposed rule. "Approximately 55 percent of the area being proposed as critical habitat is already designated as critical habitat for 42 plants and the Blackburn's sphinx moth," the rule said. The U.S. 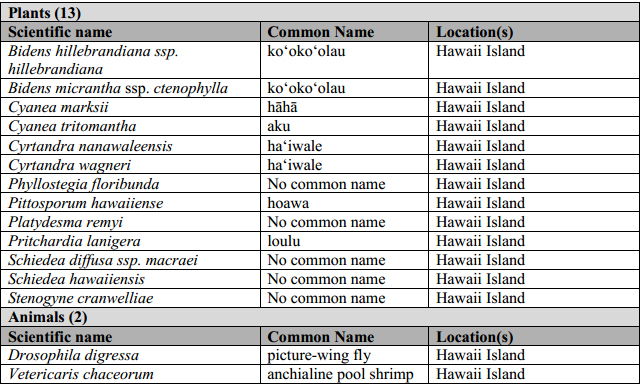 Fish and Wildlife Service plans to list 13 plants, one insect, and one crustacean on the Big Island as endangered, and to designate habitat for the yellow-flowered Bidens micrantha and two other "co-occuring" endangered plants previously listed in 1986 and 1994, the rule said. The listing "stems from a 2011 settlement with the Center for Biological Diversity requiring the agency to speed protection decisions for 757 species around the country," according to a CBD's statement. The USFWS noted in its proposal that on "the island of Hawaii, as on most of the Hawaiian Islands, native species that occur in the same habitat types (ecosystems) depend on many of the same biological features and the successful functioning of that ecosystem to survive." The agency used an eco-system approach for this listing proposal that has been previously employed on Oahu , Kauai , Molokai, Lanai and Maui . Native Hawaiian plants "evolved in the absence of mammalian predators, browsers, or grazers. As a result, many of the native species have lost unneeded defenses against threats such as mammalian predation and competition with aggressive, weedy plant species that are typical of continental environments," the proposal said. Four of the plants are considered to be the "rarest of the rare" and have fewer than 50 individuals left in the wild, according to a CBD statement.